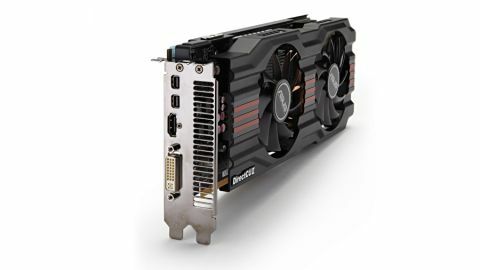 Is this the top graphics card in terms of bang for your buck? Conventional wisdom says the second-rung effort in any family of graphics chips is where the sweet spot sits, and that's where it lies in AMD's current range of GPUs. Even better, this is the full-fat iteration of AMD's second-fiddle Pitcairn graphics chip. Unlike the 7850, which makes do with 1,024 of AMD's GCN shaders, you get all 1,280 here. That's substantially up on the 1,152 GCN shaders in the PS4 and the Xbox One's 768. Then factor in the 1,100MHz core clock (this Asus board is factory overclocked beyond the standard 1GHz spec) and the gap grows wider. Although it's tempting to make comparisons with the games consoles now that both are based on PC-derived technology, it's never quite that simple. Consoles tend to have lower overheads, and developers make that little bit more effort to get their games running inside the two well defined boxes. So you want your PC graphics card to have something in hand over the consoles when all the next-gen ports pour out. Which is exactly what the 7870 offers. The 7870 knocks out some very healthy frame rates at 1080p. OK, some of the minimum frame rates look less than great. It drops below 20 frames per second minimum in both BioShock Infinite and Metro: Last Light. But in reality, the predominant experience is smoothness. This GPU is a performance win. What it's not, however, is a bargain. Plain Jane 7870 GHz edition boards can be had for less, and that's where our money would go.